Fred Clements: Grow your business - market to women! Women sometimes say they are not comfortable in bike shops, but Bridget Brennan thinks this can change. As we finish the first quarter of 2014 the U.S. bicycle business is preparing for its April gathering of industry leaders at the Bicycle Leadership Conference and the IBD Summit. We have noticed that the U.S.
Dealer reaction was swift to Giant's announcement last week of a new program to lower retail prices on 30 bike models starting March 31. Ray Keener: Take the Lane? Share the Road? Car Appeasers take the lane when they have to. Car Haters take it much more often, as a matter of principle. Which are you? A blog by Fred Clements, the executive director of the National Bicycle Dealers Association. Is there a better way for brands to receive meaningful feedback? There is now. Ray Keener: Is cheaper better? Selling used bikes as a way to serve lower-priced demand isn't the best option for every shop. Fred Clements: Are bike retail salaries too low? It’s hard to recruit the talented people you need to offer great customer service when offering relatively low wages. Webrooming is when a customer starts their shopping on-line to gather information, but uses that information to visit a local brick-and-mortar store to buy. There is some apparent movement on the problem of brick-and-mortar businesses being required to collect sales tax while internet retailers often do not. Fred Clements: Are lower price points the next big thing? Are casual bike consumers being frightened away from bike shops because of sticker shock? 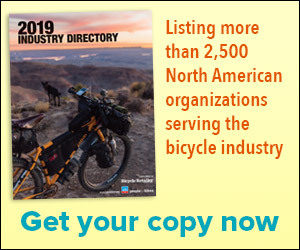 Weather will continue to play an important role in the U.S. bicycle business in 2014, but other issues are driving a continuing soft market, according to a new analysis from the Gluskin Townley Group. Fred Clements: Are bikes the new gay marriage? Bicycles are emerging as a new target for conservatives in the ongoing "culture wars" in America. A defensive response is not going to win us any battles. There has been quite a bit of ink used recently discussing trademarks and their enforcement and the folks at BRAIN wanted me to write about the topic generally. I want to make it clear that nothing written in this column is meant to comment upon or pass judgment upon recent issues in the news. If we agree with Amazon's Jeff Bezos that complaining is not a strategy, what are some strategies that will lead to success for bike shops with physical locations? A small but resolute group of bicycle industry leaders stormed Capitol Hill Wednesday to make the case for the bicycle business as a creator of jobs and commerce that benefits the U.S. economy. It is outrageous that the federal government continues to give the middle finger to brick-and-mortar businesses across the country by failing to fix a broken sales tax system. Many believe that buying from local independent businesses is a good thing, but is there credible research to back that up? Fred Clements: The future of retail? It’s the people! A British market study shows that retail staff members are the key to making customers feel comfortable while shopping, and also cause them to buy and spend more.